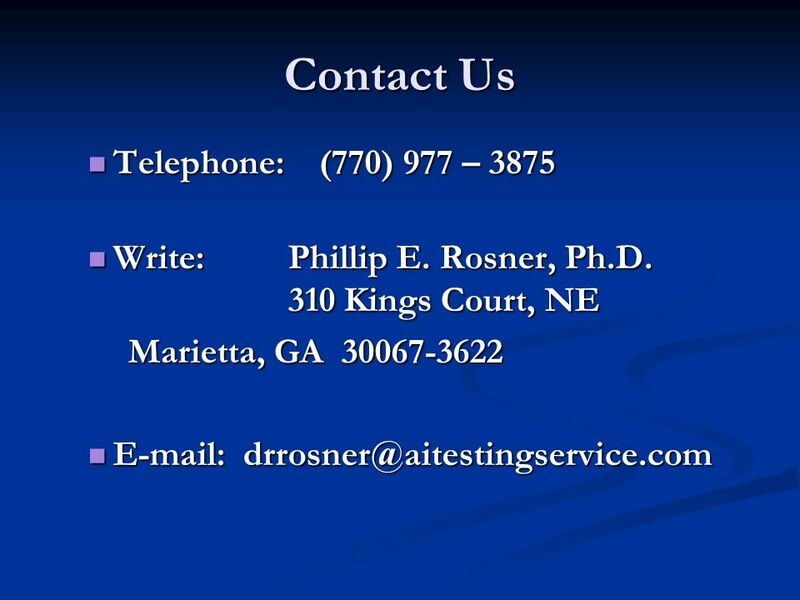 Ai Testing Service, Inc. 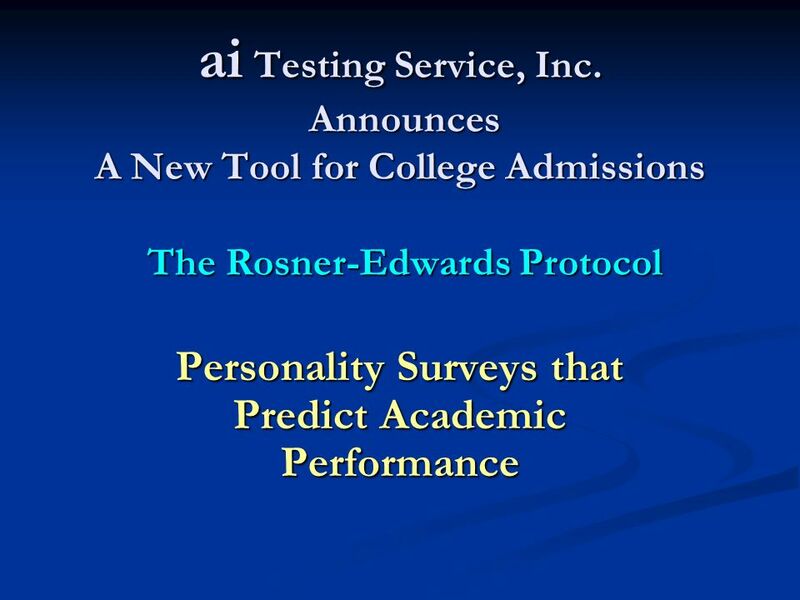 Announces A New Tool for College Admissions The Rosner-Edwards Protocol Personality Surveys that Predict Academic Performance. 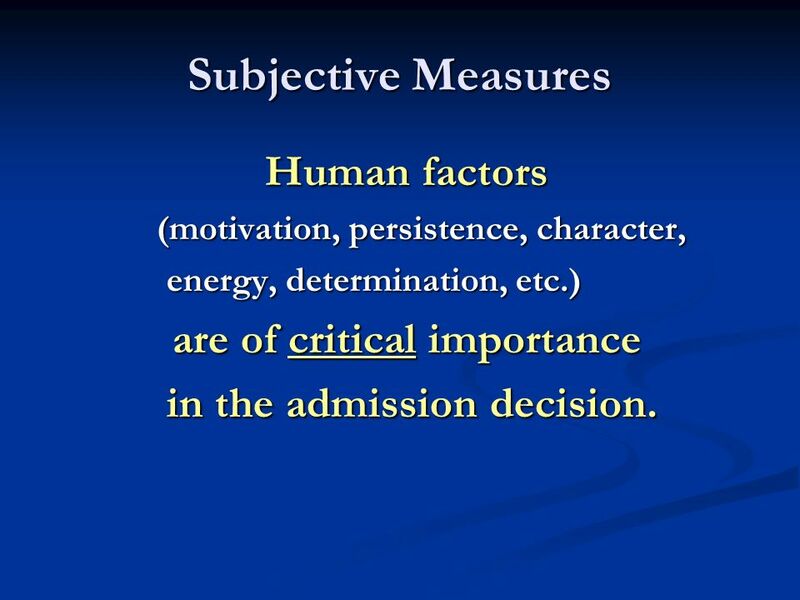 6 Subjective Measures Human factors (motivation, persistence, character, energy, determination, etc.) 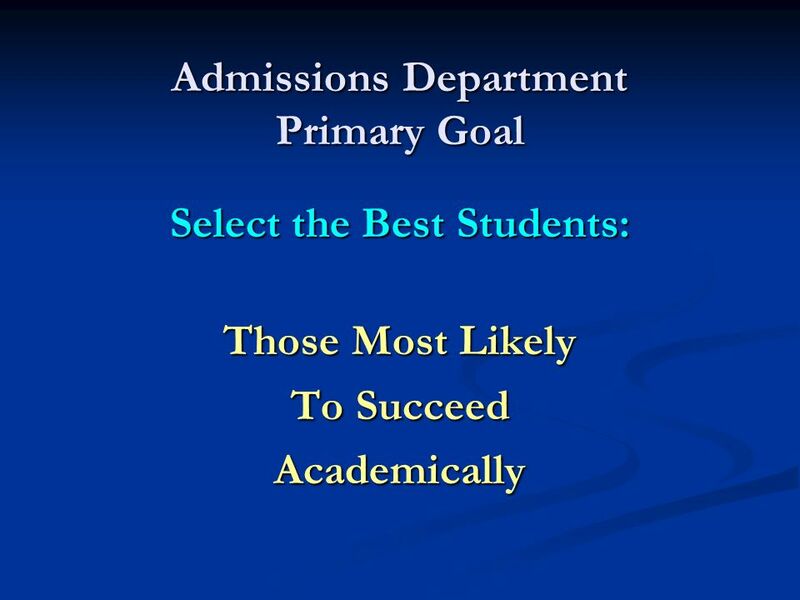 are of critical importance in the admission decision. in the admission decision. 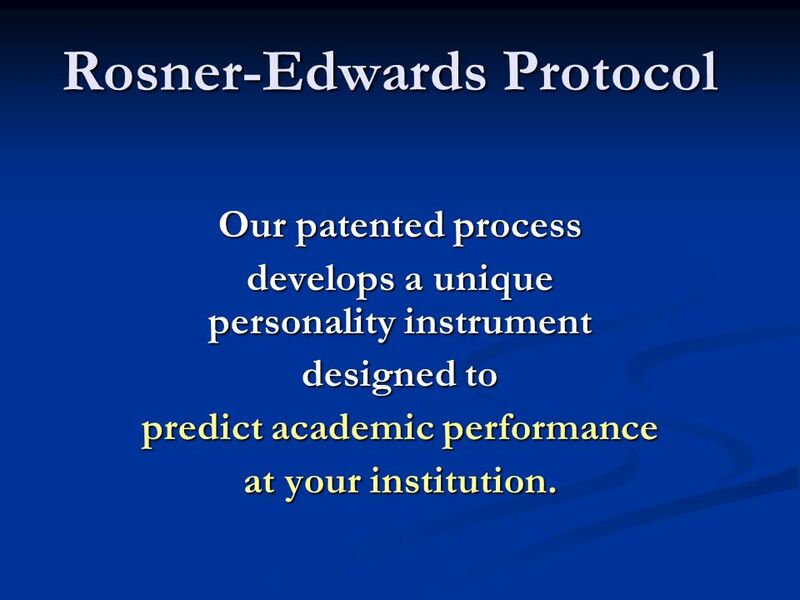 8 Rosner-Edwards Protocol Our patented process develops a unique personality instrument designed to predict academic performance at your institution. 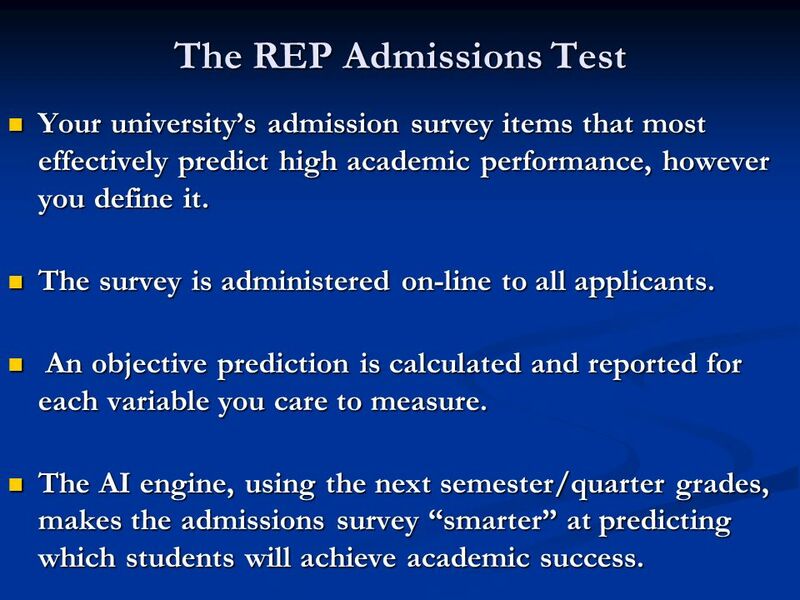 9 The REP Admissions Test Your universitys admission survey items that most effectively predict high academic performance, however you define it. 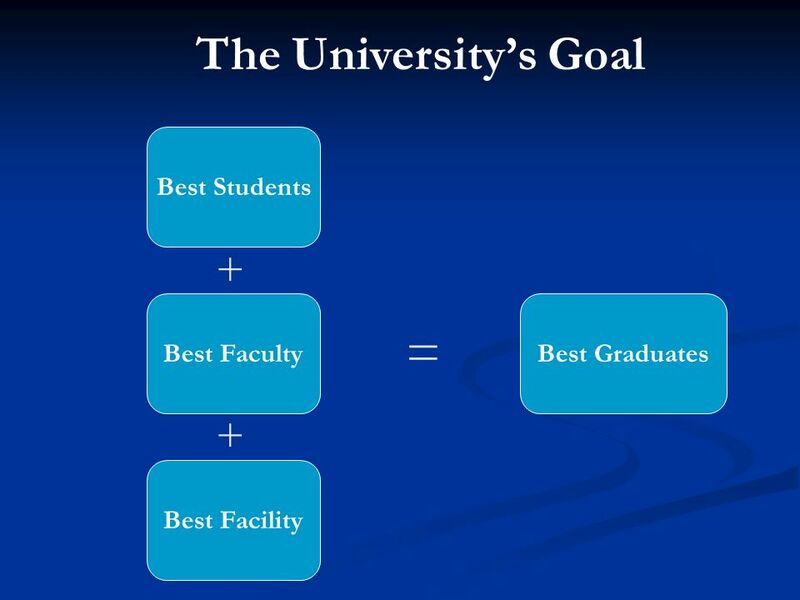 Your universitys admission survey items that most effectively predict high academic performance, however you define it. The survey is administered on-line to all applicants. The survey is administered on-line to all applicants. 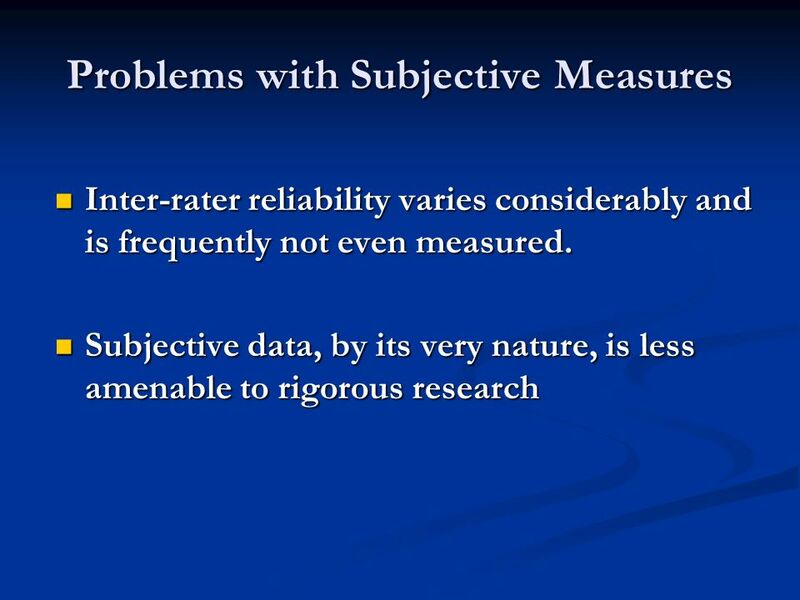 An objective prediction is calculated and reported for each variable you care to measure. An objective prediction is calculated and reported for each variable you care to measure. The AI engine, using the next semester/quarter grades, makes the admissions survey smarter at predicting which students will achieve academic success. The AI engine, using the next semester/quarter grades, makes the admissions survey smarter at predicting which students will achieve academic success. 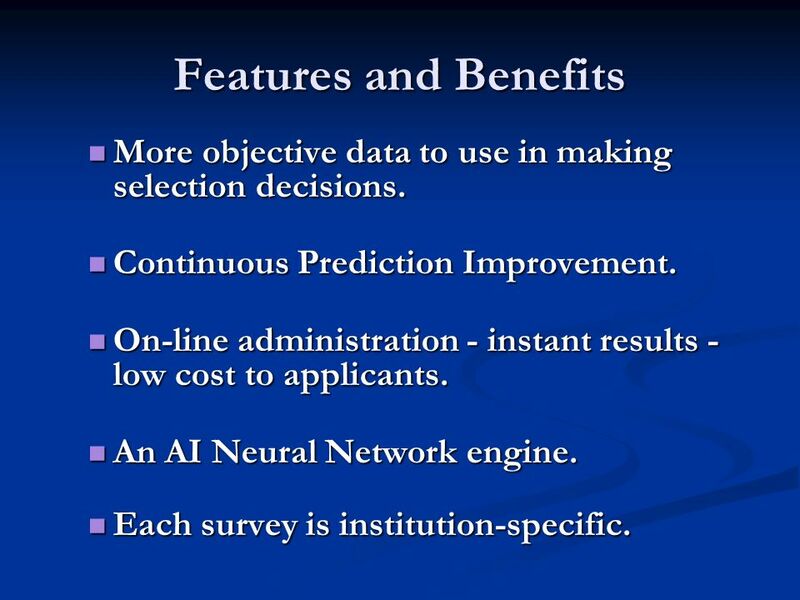 10 Features and Benefits More objective data to use in making selection decisions. 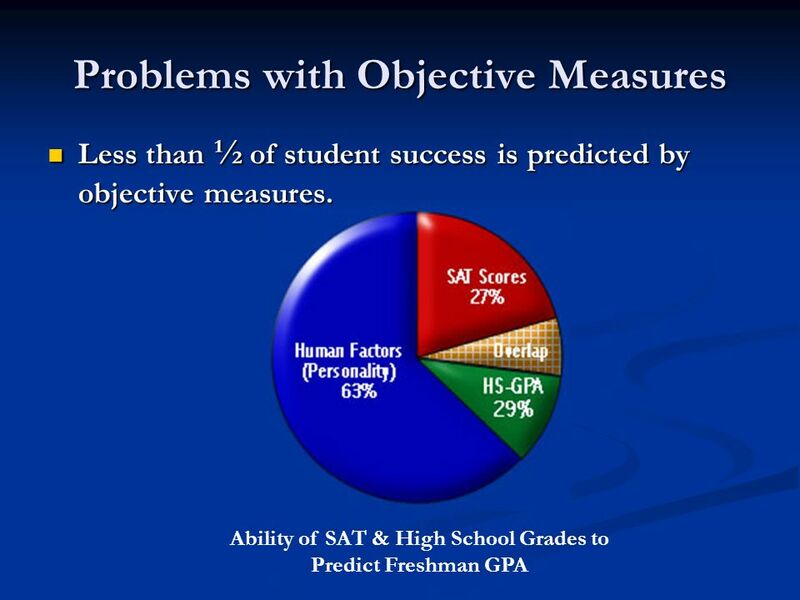 More objective data to use in making selection decisions. Continuous Prediction Improvement. Continuous Prediction Improvement. On-line administration - instant results - low cost to applicants. On-line administration - instant results - low cost to applicants. An AI Neural Network engine. An AI Neural Network engine. Each survey is institution-specific. Each survey is institution-specific. Download ppt "Ai Testing Service, Inc. Announces A New Tool for College Admissions The Rosner-Edwards Protocol Personality Surveys that Predict Academic Performance." The Rosner-Edwards Protocol (REP) A Revolution in Performance-Prediction. Private College Admissions: Building a Class Catherine Waite Assistant Director Undergraduate Admissions Santa Clara University. Graduation Action Plan: 11th Grade Career/College Planning Unit Module Four: Post-Secondary Plan. Reach Your College Goals. An Overview Why Take the PSAT/NMSQT ® Planning for College and Careers What to Expect … and When. Smarter Balanced Field Test. Common Core State Standards: Consistent Guidelines to Help Students Succeed Define the knowledge and skills students need. Smarter Balanced Field Test April 2, 2014 Lindsay McCormick Mt. Diablo Unified School District Walnut Acres Elementary School. Advanced Studies South Forsyth High School February 23, 2013. Gwendolyn Archibald Higher Education & Student Affairs The University of Iowa N491 Lindquist Center EVALUATING A GRADUATE PROGRAM. Planning for College What you need to know about the SAT. Parent Awareness Night Plant City High School Tuesday, September 21, 2010. Sophomore Seminar Class of Graduation Requirements English 4 years and one semester of Writing across the Curriculum in Grade 9 or credits. Welcome to Allatoona High School’s Honors/AP Showcase Tuesday, Feb 15, 2011. S MARTER B ALANCED A SSESSMENT U PDATES Derek Brown, Director of Assessment Oregon Department of Education. STAAR/EOC Information Meeting. What is the STAAR assessment program? The State of Texas Assessments of Academic Readiness or STAAR The new assessment.